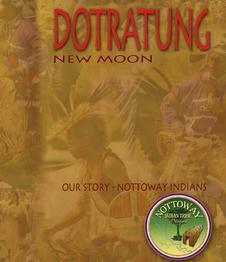 “DoTraTung” - NEW MOON, Volume 1 was unveiled for the public at this year’s <?XML:NAMESPACE PREFIX = ST1 />Nottoway Indian Tribe of Virginia Pow Wow. While the history of Nottoway people is well documented in Virginia’s historical annals, much of our history has been untold, overlooked or misinterpreted. We seek to correct errors that have been written about Nottoway history and encourage new thoughts. A new generation of academic writers is emerging with thought provoking insights into our collective past and present. DoTraTung, the Nottoway word for a new moon, is our medium of expression. All proceeds go to our supportive IRS 501(c)(3) entity the Virginia Nottoway Indian Circle and Square Foundation, Inc. Your purchases will help fund the next issue of “DoTraTung- New Moon”. Thank you for your contribution, love and support!